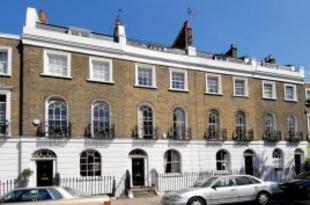 This desirable row of Regency houses was built in the mid-1800s, in the reign of George IV. It was a highly desirable property with servants sleeping quarters in the two attic rooms. One room for the maids the other for the manservant. The house had pull wires running all over the main residential rooms. The servants could be summoned by pulling on an ornate brass handle that was fixed to the wall in each room. They would activate a row of small bells in the basement kitchen to summon the maids, or manservant. By the 1930s the house had declined into squalor form its previous glory. My parents moved into number 59 and were tenants there for over forty years. They rented the basement and ground floor four rooms, from a seedy creature rightly called Mr Beetle. Mr Beetle, the renting agent came once a week to collect not only my parents rent but the rent due on all the other six rooms. My Mum and Dad were required to find tenants for the other six rooms and collect the rent for Mr Beetle . There were some very odd people indeed who came to live at number 59. The 2nd world war was terrible in Inner London. Regardless of this life goes on and I was born in 1944. My mum was evacuated to Bolton in North Manchester whilst Dad remained in Gibson Square. Despite German bombing the house remained outwardly much the same as it had been since new. The rooms were still spacious and easy to let. Though there were far fewer soft furnishings in each room. Working-class people had ‘inherited’ these rooms. Violet, was the name of a woman whose name was scratched in the window glass of the second floor front window. The story I heard some years later was a woman tenant named Violet came to my Dad’s bedroom door late one night in the war and asked for help! Apparently, she was supplementing, her meagre earnings by doing a bit of discreet prostitution; unfortunately, her client got a bit too excited and died in her bed. Dad went up to check on the bloke and sure enough he was gone. Violet complained bitterly when Dad advised her to knock for Dr McCarthy who lived on the opposite side of the square, but she didn’t want to do that. So Dad then said she’d have to go further into Liverpool Road to the phone box and ring 999 for the police to come to the house. She didn’t want to do that either. Dad had to get the police. Later it transpired that Violet was arrested, not for prostitution, but for soliciting. She received a fine at the magistrates court, and promptly disappeared from her room. No one ever knew what became of Violet, but her name was still scratched on the window when I was twenty years old. Now the wheel has turned full circle again, and as before the houses on the square are inhabited by super rich people. I wonder if the current owners of number 59 ever questioned who Violet was and why she scratched her name? This entry was posted in Autobiography, History, housing and tagged 1938-78, 59 Gibson Square Islington, Multiple occupied house, rent collection, Slum. Bookmark the permalink.